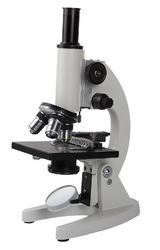 High quality Binocular Microscope for School, Colleges and Research Institutes. 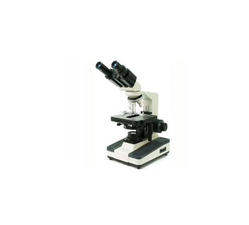 - High quality Binocular Microscope for School, Colleges and Research Institutes. - Provided with a Binocular observation head, inclined at 45 degree, with interpupillary distance 55mm to 75 mm & diopter adjustments. - Rectangular 115 x 125 mm with co-axial mechanical stage. We are engaged in offering a wide range of best quality Binocular Coaxial Microscope to our clients. It is similar to monocular co-axial microscope in specifications to with binocular head. Body: user friendly, compact and latest designed 45° inclined stable coaxial body with epoxy finish paint. coaxial binocular microscope comprising of large stand and binohead, coaxial mechanism for coarse and fine motions, coaxial mechanical stage, quadruple nose piece with ball bearings, built in solid state transformer for 6V/20 watt halogen bulb, special socket and cord. Our precisely designed to perfection Trinocular Coaxial Microscope is appreciated for high illumination power. Trinocular Trinocular Coaxial Microscope offered by us is easy to operate, as it is available with technically superior as well as user friendly features. Frame: All aluminum pressure diecasted body. Paint: P.U. coating in light cream shade. Nose piece: Reverse type Quadruple ball bearing nose piece.